If you have seen any of our recent Facebook posts you would know that we have been talking about headaches this month (if not here is a link to our page; https://www.facebook.com/BeverlyMAChiropractor/). The first step in any is a thorough history and a comprehensive exam. Regardless of the type of headaches you are experiencing we can gain a lot of valuable information by learning more about you and your daily habits. We have great success in our office helping people with their headaches and here are some of the suggestions we make that can be helpful to do at home. Like I said in a previous blog, nutrition can play a part in headaches. Whether it is carbs, gluten or another less obvious food sensitivity making some changes can help narrow things down. There is a lot of information on the web regarding elimination diets, this link has a list of “No” food that I think is pretty good: https://www.precisionnutrition.com/elimination-diet. The Whole30 and the 21 Day Sugar Detox that we have done in our office are also good places to start. Water! Whether it is due to exercise or this crazy New England weather most of us are sweating our butts off. When we sweat (or just don’t hydrate enough) our body loses essential fluid that is necessary for our body to function. When you are dehydrated the brain can temporarily contract or shrink due to loss of fluid. This causes the brain to pull away from the skull, causing pain and resulting in a headache. I heard once that our brain is about as good at telling us that we are dehydrated as a college student is at paying their bills. As a rule, it is a good idea to try to stick to ½ your body weight in ounces of water daily. Unfortunately, a lot of us spend our days in a car, on a plane or sitting at a desk. If we are not diligent about our posture, we can cause damage to our spine over time. Think about the amount of time people spend on their phones, or kids playing video games. Our head shifts forward, our shoulders roll forward, the muscle in the front of our neck shorten and the muscle in the back get stretched. Those muscles in the back of your neck attach to fascia that goes over the top of our head and attaches to muscle at the forehead. Tension in these muscles causes pressure and the classic tension headache. Along with being aware of our posture check out this video from our Instagram page for some stretching techniques: https://www.instagram.com/p/BmhTvesANoV/. 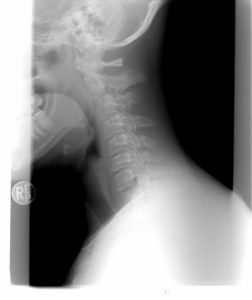 If you feel you are moving towards that picture above, you need to get in to see your chiropractor ASAP. Chiropractors are the only health professionals that can work not only with the muscular component, but more importantly the spinal alignment and movement. We also have Janet (https://in8wc.com/beverly/), our nutritionist, that can review your diet and help you make a plan for better health and less headaches. Call our office today to set up your chiropractic evaluation. 978-927-8466.